South Australia was founded as a planned colony for free emigrants in 1836, based on the systematic colonisation theories of Edward Gibbon Wakefield (1796-1862). The finances of the colony remained in a parlous state, with speculation in land and mining – the colonists were soon seized by “coppermania”. The first major finds of copper ores were opened up at Kapunda in 1844 and Burra, the “Monster Mine” in 1845. The richness of these mines made South Australia into what was known as the “Copper Kingdom”, the centre of Australia’s first mining boom, directly preceding the discovery of gold in 1851. 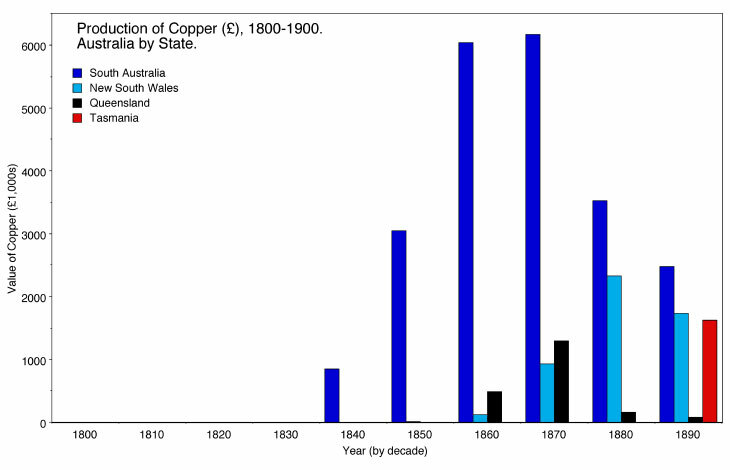 Further copper was discovered at Wallaroo at the head of the Yorke Peninsula in 1859 and was worked from 1860 onwards. By 1861 further rich deposits were located at Moonta. The three towns of Wallaroo, Moonta and Kadina form what is still known as the “Copper Triangle” or “Little Cornwall”, as they attracted large numbers of Cornish miners and migrants. While the main ore bodies at Kapunda and Burra were exhausted by the late 1870s, the “Copper Triangle” maintained production until closure in 1923. Apart from the engine houses themselves, one of the most distinctive relics of these largely Cornish settlements are the non-conformist chapels. Less distinctly Cornish are the workers cottages and terraces of single storey housing. The Welsh also had a distinctive presence around the smelting works, particularly at Llwchwr, at Burra and at Wallaroo.